Pop quiz: What’s ten times $25? Answer: It’s what someone’s getting this week from Shop Ten 25. 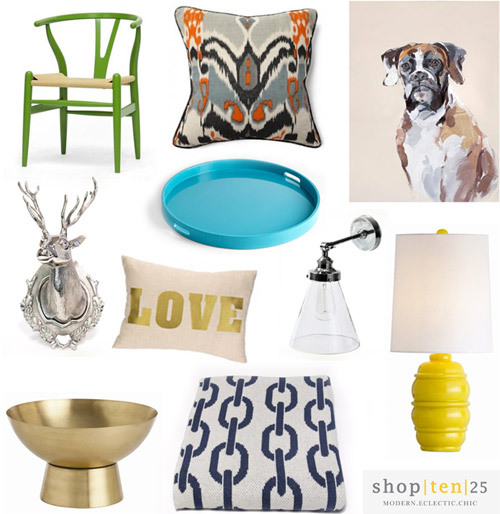 Shop Ten 25 is an online boutique with an eclectic mix of pretty home goodies. Interior designer Abbe Fenimore has curated a colorful and luxurious mix of accessories, pillows, rugs, furniture, and art that is filled with modern conversation pieces. In addition to the $250 gift card that our winner’s getting, everyone can enjoy 15% off their order now through March 5th with code YHL15. Please use the Rafflecopter widget below to enter (it might take a second to load, but it should eventually pop up below this paragraph). This giveaway is available to the United States & Canada. Just wanted to mention that I appreciate how straightforward your contest entries are. No extra steps to get more entries…just one entry per person! Thanks for keeping it simple! I was just about to comment the same thing! Thank you for not making us like Facebook pages, follow Pinterest accounts or tweet stuff. Ain’t nobody got time for that! Great competition…I wished I lived in North America!! There’s something I’ve always wondered – if we win, do you contact us via our email or should we just back and check the post for the winner every week? What a great giveaway and yes, very simple to enter!! Thanks. I love you guys because you are so real and down to earth and of course, talented! I’m so crushing on that chain link throw blanket!!! Just checked out the website and it comes in grey too… swoon! Fingers crossed! I too want to thank you for the easy entry method. Also, thanks for such interesting shops and prizes. I love discovering neat new online sources of home decor goodies! Came here to say the same as everyone else – thank you so much for not making me like a dozen Facebook pages, follow thirty people on Pinterest. And Twitter. And Instagram. And leave a comment. And do three cartwheels in a row without stopping while singing the Star Spangled Banner in Chinese. Thank you. That would be fun! Sometimes they post a picture of whatever they have won on our Facebook page! It’s always exciting to see that stuff! How many times have I just hung my head in sadness with contest posts as I always thought they were not open to Canadians… and this one is! Now, I’m dreading the idea that I’ve missed the opportunity to enter many contests! We do our best to have an international giveaway every other week (we ask every week, but some vendors aren’t legally able to vend/ship things outside of certain zones). So hopefully there are lots of opportunities for you! Ditto. I agree with everyone who likes the ease of your contests. I don’t bother if I have to like this that and the other. I quit Facebook and don’t want to go back. Thanks for introducing me to a new place. Enjoy watching the nursery come along. The boxer painting!!!! Aah! I’m working on my “wall.” Hope to have it done by the end of March….that painting would be the pièce de resistance!!! Everything is so cute. Love your giveaways! Haha! He’s definitely a friend of mine! I too am thankful for a simple entry for this giveaway! You have great content on your blog. So thanks for both of those things! I’m not sure if you guys have mentioned this before, but did you guys get to meet the former owners of the house? I’m interested to know if they follow your blog or if they would sometime in the future see the changes that you’ve made. I’d like to know if they’d like what you’ve done with the place being that it was so dated before. Just curious..
Btw, Love your blog! And not to mention all the free giveaways! Woot Woot! We have gotten to meet the original owners of our first house and the old owners of our second house so we’d love for that to happen with this house as well! Will keep you posted! Love, love, love the idea to cover the Expedit with wood!!! I know many bloggers use Expedits. I’ve purchased a couple Target versions of the cube shelves but they start to show wear and eventually look…well…cheap. Because they are! I’m curious, does the Expedit hold up really well? I’m assuming so since everyone keeps buying more! Yes, they seem to! Sometimes the sides and top can get scratched (especially if you get white and have a three year old who drags metal trains against it) but they’re really sturdy/thick/stable. We hear one of the changes they’re making to the new design is that they’re more durable and less scratch prone. Weird – I clicked on the ShopTen25 link and it seems their account has been suspended!!??? It looks like their site is down. We emailed them to let them know, so we hope it’s up again soon! This morning the site is saying “account suspended” – what happened?? Am I the only one who getting a suspended account notification when I click on the shopten25 website link? I can’t even log on to their website. It says, “account suspended.” Is anyone else having a problem this morning? Hey, the Shop 10 25 website is down looks like – it leads to a page that says nothing but “Page Suspended”. Do you think all us readers broke it?? Not sure if it matters to you, but the link to shop Ten 25’s website is down – says the account has been suspended? I am excited about this giveaway! When I followed the link to Shop Ten 25 to do some browsing, I was taken to a page that says account suspended. Thanks for all the tips guys! It looks like their site is down, but we emailed them to let them know, so we hope it’s up again soon! Yes – in addition to appreciating the ease you’ve enabled for entering the contest using Rafflecopter, I just wanted to underline how I’ve changed my previous opinion. I was bummed that the comment section was gone in the first place and like a loser I let you know my opinion about how you run your business. Any who – this really is much better and my employer probably appreciates that I don’t read all of those comments at work anyway :-) I know that it lets you do more things – like projects or photography or writing- than you would have been able were you still manually moderating all those thousands of comments. And that means more great posts for us!! You guys are awesome!!!!! Aw thanks so much Kati! The lamp looks like a beehive ;) These items look cute!! The Shop is back up and running! We apologize for the inconvenience, but a few hackers thought they would try to ruin our fun contest!!! Best of luck to everyone, we are looking forward to seeing what the winner chooses! So glad it’s back up! I am having a tough time trying to enter contest. It keeps saying aww shucks. We didn’t get your entry. It keeps saying “Loading”. I have been trying since yesterday. Anyone else having issues? This is my first time entering in all the years I have been following lol go figure! Oh man, that stinks! Anyone else have a suggestions for Jessica? It seems as if other entries are coming in without an issue, but maybe try a different browser (IE instead of Firefox?) or entering via phone (if you have a smart phone) in case your computer is blocking it for some reason? I’m not having that issue now but have in the past. Try a different computer if you can. Love that green chair! This is random, but how do we know if we were to win? Would we get an email? I’m constantly just deleting all the emails in my spam/junk and am now wondering if I should sift through. WOW I won!!! Thank you!